The intelligent digital mesh is a foundation for future digital business and its ecosystems. To create competitive advantage, enterprise architecture and technology innovation leaders must evaluate these top trends to identify opportunities that their organizations can exploit. 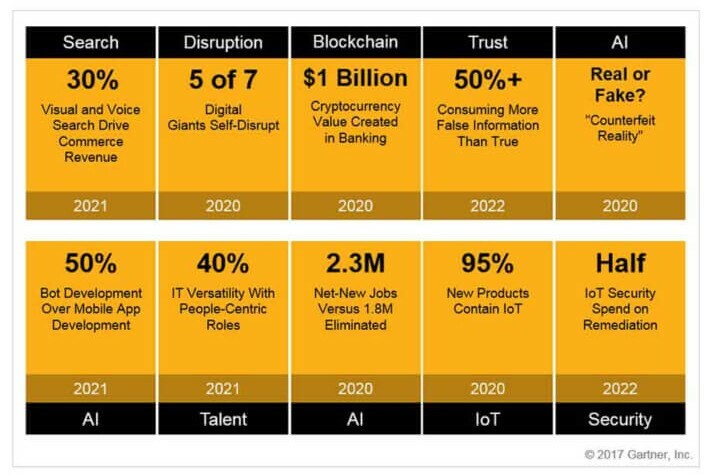 Artificial intelligence, immersive experiences, digital twins, event-thinking and continuous adaptive security create a foundation for the next generation of digital business models and ecosystems. By 2021, 40% of IT staff will be "versatilists" holding multiple roles, most of which will be business- rather than technology-related. The trend of digital innovation will continue to evolve and it is important that IT leaders develop a reasonable pace for adoption and bimodal development. View our top predictions and understand what is required to develop a discipline in pace.